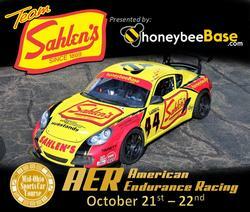 Team Sahlen presented by honeybeeBase.com returns for the 3rd straight year to American Endurance Racing’s Mid-Ohio Sports Car Course Event. In 2015, the team made their debut with American Endurance Racing at the Ohio track and secured 1st place in both Saturday and Sunday’s 8 ½ hour endurance events. When Team Sahlen returned last year for this fall event, the final results saw the team secure 2 hard fought runner-up finishes in the dual enduro races. For 2017, Team Sahlen is looking to improve 1 position from last year and re-secure the overall victories at Mid-Ohio from two years ago. In Team Sahlen’s previous 2017 outing with American Endurance Racing at the April Sahlen’s Sports Car Springfest at the Glen, victory was secured overall in both the Saturday and Sunday 9 hour enduros. The Sunday victory at the Glen was especially memorable for Team Sahlen as the win came with their newest Porsche Cayman. This particular Cayman was equipped with a PDK Automatic Transmission. After this success at the Glen, Team Sahlen was so enthusiastic over the performance of the PDK, that another Cayman was acquired with an Automatic Transmission. This newest Cayman, named Saucy, will make its debut with Team Sahlen this weekend.